Patrick Lencioni is one of my favorite authors, having written several extraordinary business books such as The Five Dysfunctions of a Team, Death By Meeting, and Silos, Politics, and Turf Wars. 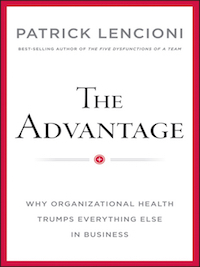 Lencioni is an excellent storyteller and uses fables to convey important business insights and teachings. The Advantage was published in March of 2012 and is his first book that doesn’t employ a fable format. However, it shines in its ability to organize and convey with clarity the important teachings in his previous books, including the three I mentioned above.